Each coin is individually numbered - the earliest orders will receive the lowest numbers. A special collector’s edition, featuring Maklouf’s official 90th birthday portrait of the Queen. Layered in pure 24 carat Gold and limited to only 49,999 coins worldwide. Each coin is individually numbered, meaning your coin is the only one with that number. In 2016, Her Majesty Queen Elizabeth II celebrated her 90th birthday. Never before has a British monarch reached the grand age of 90. To commemorate this milestone, British and Commonwealth coin designer, Raphael Maklouf has created his official 90th birthday portrait of the Queen. For twelve of those years from 1985 to 1997, a stunning ‘regal and ageless’ portrait of Her Majesty, created by master-sculptor Raphael Maklouf, shone from the face of every British coin. Maklouf began his apprenticeship in sculpture at the age of just thirteen and, by the time he had beaten sixteen other candidates to create the third official coin portrait of Her Majesty, he was a man working at the height of his artistic powers. Today, his talent and craftsmanship remain utterly undimmed and now, thirty years after his first portrait appeared, Raphael has poured his skill and artistry into an exquisite new effigy of the Queen created in honour of her ninetieth birthday. Maklouf was determined only the most fitting coin was issued to mark the 90th birthday. 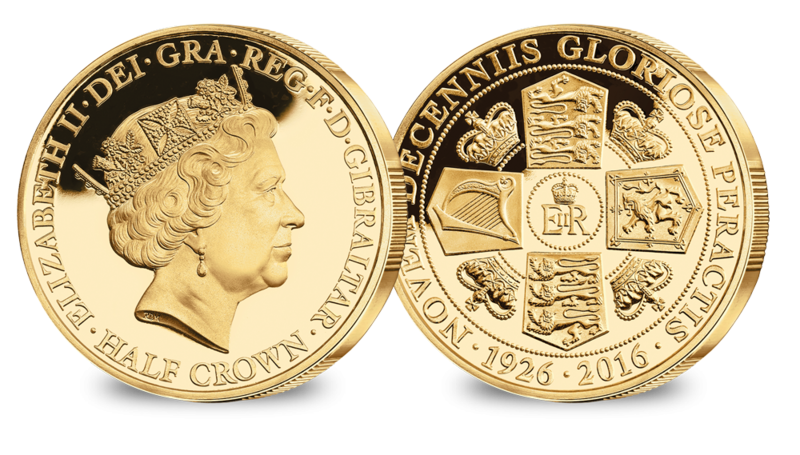 In his own words "...I was determined to ensure only the most fitting coin was designed to mark this exceptional occasion". Drawing inspiration from his earlier portrait, Maklouf has created a new couped portrait of Her Majesty the Queen in which she once more wears the Royal Diamond Diadem and earrings that mark Maklouf’s portraits. With extraordinary skill, he has also managed to depict the quiet happiness that has marked the latter part of Her Majesty’s record-breaking reign and shows a Queen, deservedly content after nine decades gloriously accomplished. The reverse symbolises the shields of the Royal Arms. Located at the north and south positions are the shields that represent England, containing three lions passant. A lion rampant represents Scotland in the east position, and to the west is a harp that represents Ireland. The four quadrants depict the St. Edwards crown, encircled by the Latin inscription ‘NOVEM DECENNIS GLORIOSE PERACTIS’ (nine decades gloriously accomplished).